By replacing the lasagna noodles with thin sliced zucchini you can create a delicious, lower carb lasagna that is loaded with vegetables. In a medium sauce pan, brown meat and season with salt. When cooked, drain and remove any fat. Add olive oil to the pan and sauté garlic and onions about 2 minutes. Return the meat to the pan, add tomatoes, basil, salt and pepper. Simmer on low for 30-40 minutes, covered. Do not add water, the sauce should be thick. Meanwhile, slice the zucchini into 1/8" slices and lightly salt, set aside. Zucchini has a lot of water when cooked, salting takes out some of the moisture. After 10 minutes, blot excess moisture with a paper towel. Grill the zucchini slices on medium heat for 2-3 minutes per side. In a medium bowl, mix ricotta cheese, parmesan cheese and egg. Stir well. 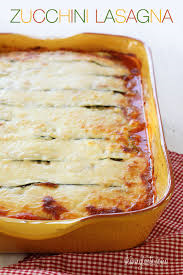 In a 9x12 casserole dish, spread 1/2 cup of sauce on the bottom and layer the zucchini to cover. Spread 1/2 cup of the ricotta cheese mixture, then top with 1 cup of the mozzarella cheese and repeat the process until all of the ingredients are used up. The last layer top with remaining zucchini and sauce. Cover with foil and bake for 30 minutes. Uncover the foil and bake for 20 minutes, then place the remaining 1 cup mozzarella and bake until melted. Let stand for 5 minutes before serving.